6 May – A stunning new work of land art will be unveiled this summer in Dumfries & Galloway, created by world-renowned landscape artist Charles Jencks. 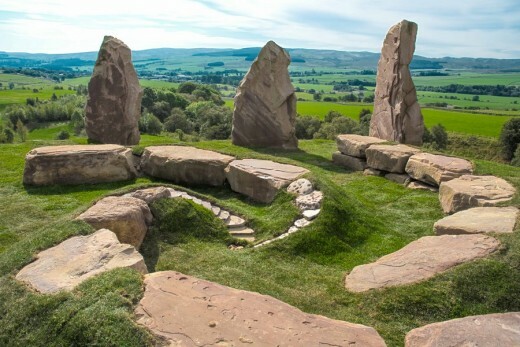 The Crawick Multiverse – a £1million project funded by the Duke of Buccleuch – sits on the site of a former open cast coal mine which is being transformed into a spectacular 55-acre artland, visitor attraction and public amenity. Materials found on the expansive site, from tonnes of earth to some 2,000 large boulders, were used to create the work of art in Upper Nithsdale in the heart of Dumfries and Galloway, which is expected to provide an economic boost to local communities as well as attracting international visitors. 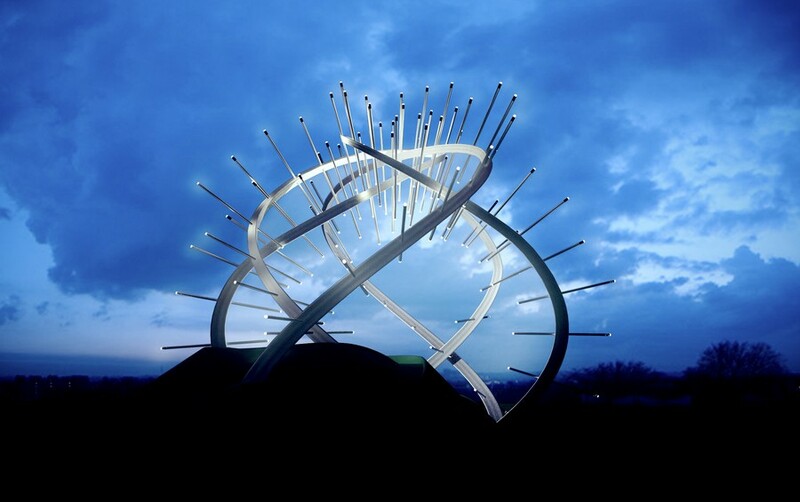 This inspiring new landmark links the themes of space, astronomy and cosmology, with a network of paths navigating features and landforms which represent the Sun, universes, galaxies, comets, black holes and more. 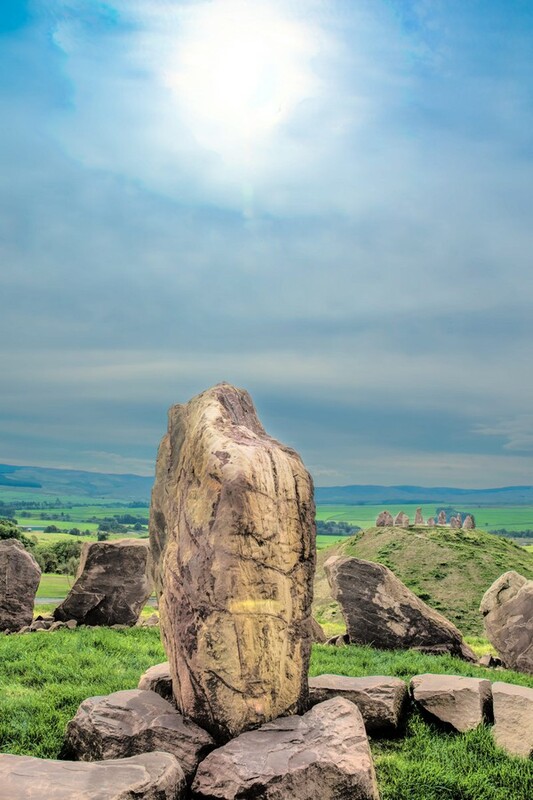 Work on the Crawick Multiverse is nearing completion, with a public launch event scheduled for the summer solstice on June 21. It is the latest in an impressive portfolio from Charles Jencks, a leading figure in landscape architecture who has created works across the globe, from the UK’s ‘Northumberlandia’ and ‘Garden of Cosmic Speculation’ to Beijing Olympic Park’s ‘Black Hole Terrace’, to name just a few. The Duke of Buccleuch said: “Not only has Charles Jencks transformed a brutal eyesore into a landscape of awesome scale and beauty but he has also created something that just might be a catalyst for transformation in this neglected corner of rural Scotland. 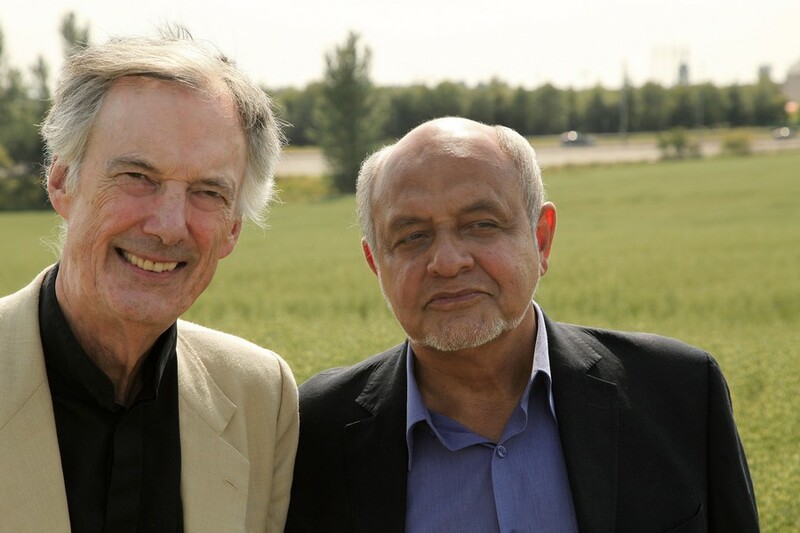 Charles Jencks added: “This former open cast coal site, nestled in a bowl of large rolling hills, never did produce enough black gold to keep digging. But it did, accidentally, create the bones of a marvellous ecology. “The landscape had to be healed, it had to welcome the nearby communities of Sanquhar, Kelloholm and Kirkconnel, and help restore the locality both economically and ecologically – and so the Crawick Multiverse, a new version of an old scientific idea, was born. The site is managed by the Crawick Artland Trust which includes trustees from the local communities surrounding the site. Duncan Mackison, Director of Crawick Artland Trust, said: “We are very excited to see this ambitious, large scale project nearing completion and are confident it will prove to be a huge draw for visitors from both home and abroad. 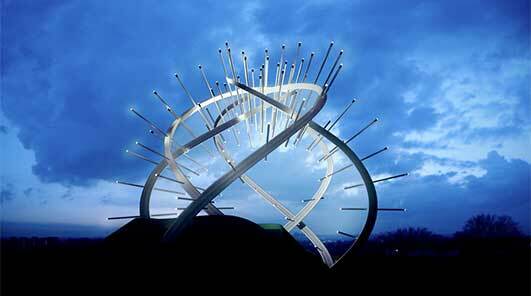 Star of Caledonia – world class landmark, designed by world-leading artist/designer Cecil Balmond and Dumfriesshire’s eminent land artist Charles Jencks, on the border between Scotland and England. Born out of an idea by Balmond to capture the powerful energy, scientific heritage and magnetic pull of Scotland, the design pays homage to Scottish innovation and particularly James Clerk Maxwell, the pre-eminent Scottish physicist and mathematician. 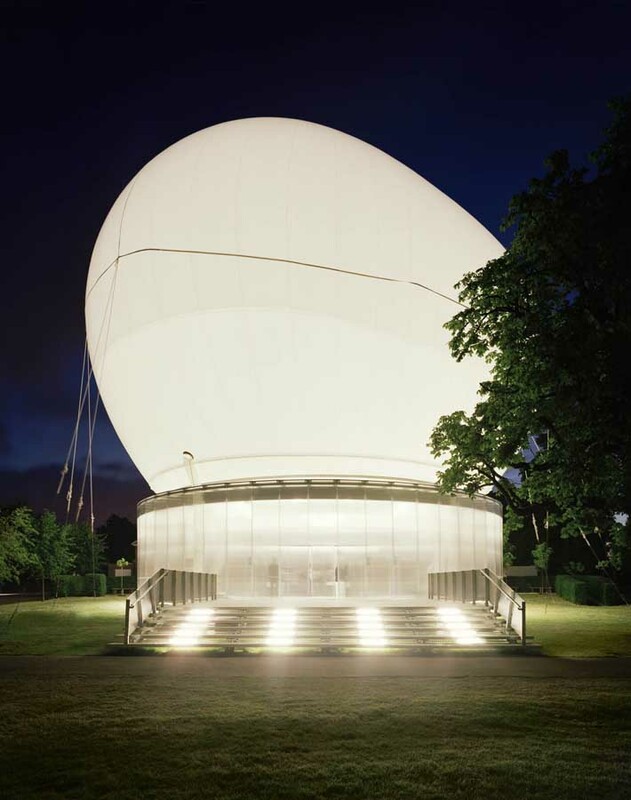 This Edinburgh project by world-renowned architecture critic and theoretician, Charles Jencks, (who lives in the Scottish Borders & London) and Terry Farrell & Partners has been followed on the site at the Scottish National Gallery of Modern Art from initial images to site shots and grand opening. Landform is apparently influenced by Seurat’s famous La Grande Jatte painting from Paris showing families relaxing amidst greenery and water in the heart of the city. Landform by Charles Jencks has proved to be very popular with many, especially children. However, Landform is occasionally closed due to the grass surface which takes some wear and tear, esp. in Winter. Charles Jencks sits on the selection committee with Maggies Centres founder Laura Lee: a key architect selected by Charles Jencks was a friend of the late Maggie Keswick-Jencks, Frank Gehry. Charles Jencks was born in 1939 and although American has a house in London and Dumfriesshire, Scotland; the latter was the home of his wife, the late Maggie Keswick-Jencks, who sadly died of cancer. Maggie came from a notable Scottish family with links to the founding of Hong Kong.